Size: 5.0" x 3.5" x 1.1"
You know this cute math trainer, the Little Professor. Millions and millions were sold in the past 2½ decades from this simple but funny educational product. 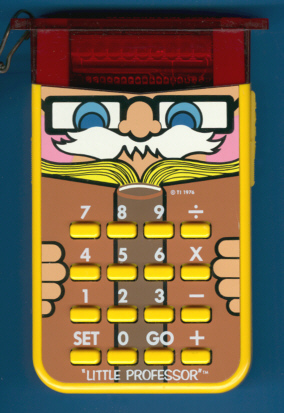 The basic idea behind the Little Professor is opposite to a normal calculator: The child has to type the answer of simple questions like " 3 + 5 = ? ". You can choose between the four basic math functions and four different grade levels. If the child gives a wrong answer "EEE" occurs, otherwise another of more than 16000 different questions is asked. This educational toy was rated by Texas Instruments for childrens aged between 5 and 9 years. From the technology this Little Professor from 1976 is similar to the TI-1200 calculator of the same epoche. You'll notive a similar evoluting during the production to optimze manufacturing costs. The pictures on the right compares two Little Professors, an early one and a later one. This first version of the Little Professor could easily recognized at the two sliding switches left and right from the face. The label on the backside of the Little Proefssor was dropped during production, compare them here. During 1980 it got additional keys for ON/OFF and LEVEL. Compare them here. Another education toy of this time is the rare MATH MAGIC and its sibbling WIZ-A-TRON. The Little Professor was mentioned in TI's press release dated August 15, 2002 to celebrate the 35th anniversary of its invention of the electronic calculator. Little Professor. A fun way for children to practice basic math facts. The Little professor is a unique product designed specifically to aid children 5 years and older in exploring basic mathematics. Although it is not truly a calculator, the Little Professor generates a sequence of problems – over 16,000 preprogrammed problems in all – and involves children in math practice through an enjoyable instant feedback and reinforcement situation. By using the four-position switch indicating degrees of difficulty, and the appropriate function key ([+}, [-], [x], [/]), the teacher can select a range of random math problems needed for individual students. The student can then work independently as he progresses toward mastering math skills. Problems appear on the large LED display as an equation, ad the child is gived three opportunities to input the correct answer through the keyboard. An error indication is displayed for one second each time the child incorrectly answers the problem. If the correct answer is not given in three chances, the completed equation appears in the display, allowing the child to see the mistake. By pressing [GO], he can then proceed to the next problem. If the child inputs the correct answer, the complete equation is displayed for one second and a new problem appears. As an additional incentive, the Little Professor displays the score of correct first answers after each set of 10 problems. Powered by a single nine-volt disposable battery, the Little Professor is fully portable and is perfect for individual students use in the class room.